Despite what global warming alarmists want you to believe there’s a very good reason to stock up on winter gear…as this winter is supposed to be pretty harsh. Scientists have predicted this winter is going to be pretty severe based on the El Niño pattern they’ve been able to observe. If you’re curious what an El Niño pattern might be and why it’s going to create a seriously violent winter allow me to explain. Ok, that’s the dictionary definition. Basically it’s warm water off America’s western coast that creates some pretty dynamic weather. Warm weather pushes warm air over the U.S. and then cold air from the North mixes with that air and then creates all kinds of crazy weather patterns. And right now scientists are warning of a “Godzilla El Niño” that could wreak havoc all over the U.S.
And not just in terms of heavy snow either. Here’s what some scientists and weather experts are writing. According to some research this could actually contribute to a worsening drought on the Western part of the U.S.
States like California, Oregon, and Washington have watched as water tables have dropped to dangerously low levels in the past few years. Apparently this winter’s El Niño could make it so water levels continue to drop. Then there’s how El Niño will affect precipitation in other parts of the country. Eric Holthhaus wrote about how El Niño will create more snow. Back in 2012, in my New York City weather column in the Wall Street Journal, I did a quick analysis that showed El Niño winters brought an additional 10 inches of snowfall to the Big Apple, all else being equal. To get especially strong winter storms in the Northeast, the large-scale El Niño signal (which increases the amount of wintertime moisture available along the East Coast) needs to coincide with a weak and wavy jet stream. That’s a recipe for heavy snow. And while he was just writing about NYC, these same truths hold true for a large portion of the Midwest and the Northwest. More than 100 million Americans live in a swath of the U.S. that could see some major snow events, and total accumulations could stack up not just in inches, but in feet! That means if you live in those areas you need to be prepared for the possibility of having to battle with mounds of snow everywhere…and the ensuing craziness involved in battling with snow. And then there’s the brutal cold you’ll want to think about. 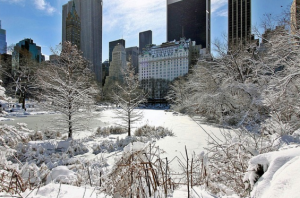 You might remember last year’s polar vortex which caused parts of the nation to experience abnormally low temps. Looks like that could happen again which is bad news for people in older houses, or who are isolated from consistent power. Science Daily writes that because of El Niño we could see temps well below the normal…we’re talking double digits below zero. Meaning if you don’t have some way to keep warm and the power goes out you might really be in for a rough ride. There’s also the risk of flooding in the Southern parts of the U.S. “El Niño tends to bring above normal rainfall to the South during the winter months.” And after heavy rainfall this spring and summer constant downpours could really do some damage. Not to mention the plethora of other ways El Niño might affect us. What does that mean for preppers? Basically you need to have some winter survival gear in place. There’s definitely a lot to worry about. And when you consider how fragile our nation’s electronic grid is and how volatile the economic situation with our debt and all is…you shouldn’t count on the government to help. One of the best places to start is with the SOL Bivvy. 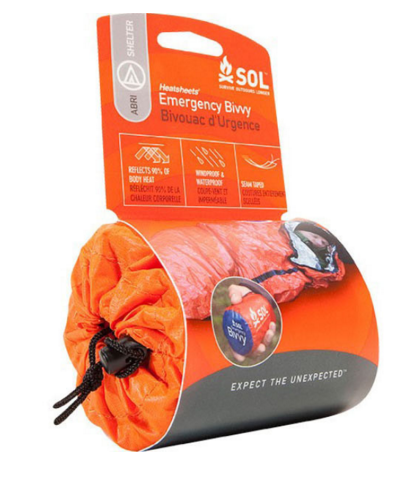 This emergency blanket/sleeping bag can help add tons of warmth to your survival kit and could help keep you warm if the power ever goes out. Click here to get your discounted SOL Bivvy. This entry was posted in Uncategorized on December 16, 2015 by Survival Frog.